In an abc.com article, Dan discusses the reasons that George Zimmerman will not be charged with murder or manslaughter. 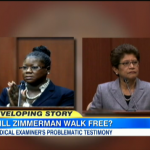 Dan writes, “As a legal matter, even if jurors find parts of Zimmerman’s story fishy, that is not enough to convict. Even if they believe that Zimmerman initiated the altercation, and that his injuries were relatively minor, that too would be insufficient evidence to convict. Prosecutors have to effectively disprove self defense beyond a reasonable doubt.” He continues to discuss the legality of Zimmerman’s case, “If jurors believe Zimmerman followed Martin, maybe even racially profiled him and initiated the altercation, can Zimmerman still legally claim he needed to defend himself and walk free? Yes.” Read the full piece on here.